What happens when the wild-born baby you take in isn’t really an orphan? We’ve seen this happen so many times. Someone will take in a wild-born baby in the woods, thinking they’re doing the right thing. Most of the time, the mother is just away hunting to provide for her baby. Apparently, this is what happened with bobcat Archer. A family had taken him in when they found him as a baby. Now over a year old, he’d already become imprinted on humans. He’s been living with domestic cats at their home. But, as wild cats mature, their wild behavior becomes more and more pronounced. Why did Archer need placement at The Wildcat Sanctuary? When Archer bit this owner, the family turned him over to authorities to be destroyed. Luckily, authorities instead took him to a licensed rehabber. She knew that he had little chance of survival in the wild, as he’d always see humans as a source for food. She began searching for an alternative for him. When she called to see if we could possibly make room for him at the sanctuary, we did what we know you’d want us to do. We said “yes!” Our trained transportation volunteers dropped everything to drive over 2,000 miles in two days to bring him back to his forever home here at the sanctuary. 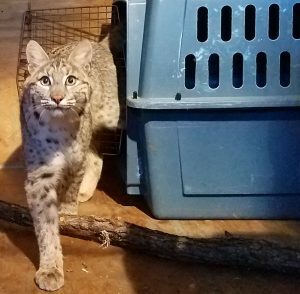 Our first choice would have been for this innocent baby bobcat to live wild and free. But, due to the actions of humans who intervened, that isn’t an option for him. He wasn’t left with his mother in the wild to teach him the survival skills he’d need. He’d been robbed of that. Thankfully, your support helps us give him the opportunity for a new beginning though. He’s been through so many hands already. 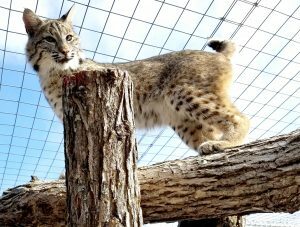 Hopefully, he’ll bond with another wild-born bobcat arriving soon and they can live out their lives wild at heart here. That’s the future we’re so grateful you provide with your commitment and support. If you’d like to be bobcat Archer’s sponsor parent, he’d love that!! Be sure to check out how HERE.